"[S]ince the start of the recession in December 2007 and throughout the recovery, the value of U. S. currency in circulation has risen dramatically. It is now fully 42% higher than it was five years ago. ... Over the past five years, cash holdings increasedon average about 7¼% annually, more than three times faster than theeconomy’s growth rate over this period. At the end of 2012, currency in circulation stood at over $1.1 trillion, representing a staggering $3,500 for every man, woman, and child in the nation." To get a sense of what's happening here, consider this figure. The red line in the middle shows growth of GDP over time. 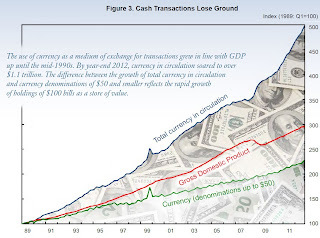 The green line at the bottom shows the growth of U.S. currency in circulation in denominations of $50 or less. 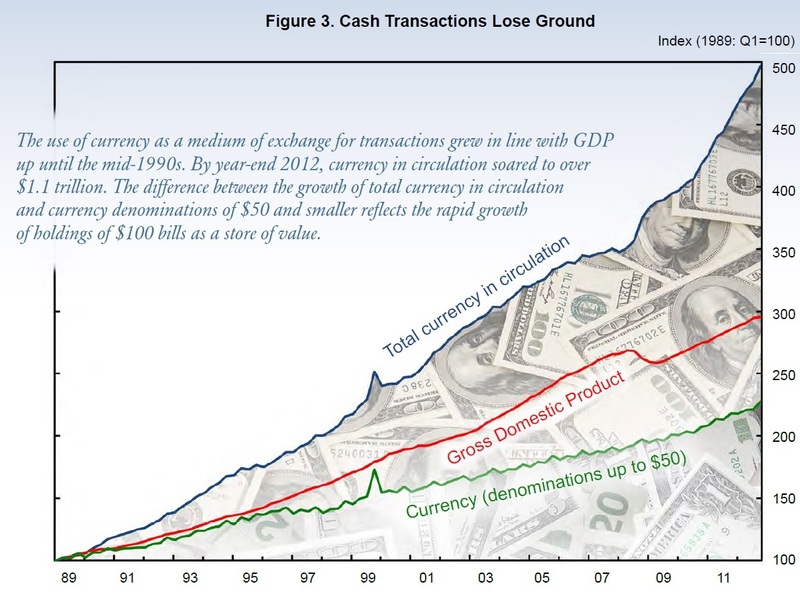 The blue line at the top shows total currency in circulation: that is, the gap between the green line and the blue line is made up of $100 bills. From 1989 through the early 1990s, the growth of currency with denominations of $50 or less pretty much tracked the rise in GDP. But with the arrival of all the alternative methods of payment listed above, the rise in currency in denominations of $50 or less began to lag well behind the rise of GDP. However, overall currency in circulation, and especially those $100 bills, have risen faster than the rise in GDP. the safety of the banking system spread in late 2008, many people became terrified of losing their savings. Instead, they put theirtrust in cold, hard cash. Not surprisingly, as depositors socked away money to protect themselves against a financial collapse, they often sought $100 bills. Such a large denomination is easier to conceal or store in bulk than smaller bills. Indeed, in the six months following the fall of the investment bank Lehman Brothers in 2008, holdings of $100 bills soared by $58 billion, a 10% jump." But it's not just Americans who hold U.S. currency. If you were a European looking at the financial and banking struggles across the continent, holding some U.S. dollars in the form of cash might make some sense. 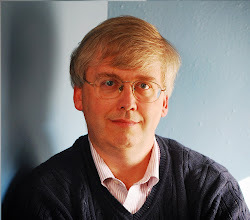 Williams writes: "As Europe’s crisis worsened in the spring of2010, U.S. currency holdings rose sharply. And they continued to rise as economic and political turmoil and uncertainty about the future sent Europeans scrambling to convert some of their euros to dollars. It’s estimated that the share of U.S. currency held abroad rose from about 56% before the tumultuous events of the past five years to 64% in 2011." My guess is that many of the newly well-to-do in China, India, Brazil and Russia have also built up a stash of U.S. $100 bills. In both of these situations, it's important to notice that with interest rates at such extremely low levels, those who decide to hold cash are not giving up much in terms of foregone interest payments. Two other explanations are sometimes offered for the rise of cash, but they are probably minor factors. First, price levels in general have risen, and so more people are likely to use $100 bills for transactions--like buying a tankful of gasoline or going grocery shopping. While this is probably a contributing factor, not that many people are walking around with $100 bills in their wallets for daily transactions. Second, $100 bills may be used to pay those in the "gray economy," all those people who work jobs that are paid in cash and not reported to the IRS or Social Security or unemployment insurance or workman's compensation. Again, this is probably a contributing factor, but most cash-based employers are not handing their nanny or gardener a few $100 bills.